The company says the new output rate could be achieved with an increase of 6 percent in capital costs for the first phase of development. Canadian development company Northern Graphite (TSXV:NGC,OTCQX:NGPH) is expecting to increase annual concentrate production by at least 20 percent at its Bissett Creek graphite project. As a result of an ongoing review of the economics of the project, led by G Mining services, the company said the new output rate could be achieved with an increase of six percent in capital costs for the first phase of development. “The Bissett Creek project already has attractive economics at current prices and they will be further enhanced by the higher production level,” CEO Gregory Bowes said in a press release. The first phase of development, for which a feasibility study has previously been filed, estimated producing 20,800 tonnes of graphite concentrate per year with a capital cost of US$101.6 million. But based on the new analysis, the company intends to integrate an initial production rate of approximately 25,000 tonnes per year. Phase 2 involves a future doubling of production, based on measured and indicated resources only, to meet the expected growth in graphite demand. With higher output and lower unit costs contemplated in the latest analysis, the company expects a meaningful increase in the project net present value (NPV) and internal rate of return (IRR) of both phases. Currently, the pre-tax IRR is estimated at 30.1 percent and the pre-tax NPV is set at US$304.9 million, using an eight percent discount rate. Speaking about the potential concerns of introducing new supply into the market, Bowes said he doesn’t believe higher production will significantly increase any risk associated with this. “Most graphite deposits contain large resources but production must be “right-sized” for target markets as some large, low-margin segments are currently unattractive to western producers,” he added. Northern’s strategy is to focus on higher value industrial markets, mainly in the US and Europe. “Many require large and XL flake graphite and the company is fortunate to have a deposit with a very high percentage of these grades when demand is growing, Chinese production is declining and the only North American source is near the end of its life,” Bowes said. Looking ahead, the company is working on a metallurgical test program to confirm graphite recoveries, concentrate purity and flaze size yield to then determine if a new updated NI 43-101 report for the project is needed. 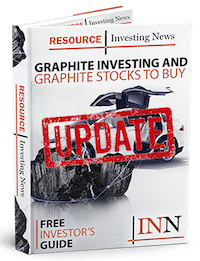 On Monday (February 11), shares of Northern Graphite were up 2.56 percent, trading at C$0.20.